Despite the urge to say things like "Yer a wizard, Harry!" I enjoyed the hell out of Doctor Strange. The origin story of Marvel's Sorcerer Supreme opens with a decapitation courtesy of the sorcerer Kaecilius (Mads Mikkelsen) and his followers, who break into the magic library of Kamar-Taj to steal a mystical text from the library of the Ancient One. The Ancient One attempts to stop them and pursues them, but they get away after some nifty, Inception-level twisting of the landscape. 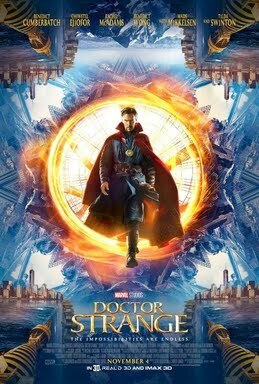 In New York City, our hero, Stephen Strange (Benedict Cumberbatch) is an acclaimed neurosurgeon, but he's not the McDreamy-type with long flowing locks and loving glances and make out sessions in the elevator- instead, he's arrogant, likes expensive watches and fast cars (and I have to admit, this Honest Trailer does come pretty close to the mark) and naturally, crashes one of those fast cars and loses the use of his hands. Obsessed with regaining control of them he pushes everyone in his life, including one of the last friends/former lover's he has, Christine Palmer (Rachel McAdams). Seeking alternative treatments, he heads to Nepal to search for a treatment in the mystical sanctuary of Kamar-Taj. They make their movie, first destroying the London Sanctum and then moving on to the New York Sanctum. Strange holds them off until Mordo and the Ancient One arrive, but in the ensuing battle, the Ancient One is mortally wounded and Mordo's confidence is shattered when he learns that the Ancient One must draw from the power of Dormammu to sustain her life. Strange and Mordo arrive in Hong Kong only to find the sanctum destroyed and the Dark Dimension already eating Earth- but with the Eye of Agamotto, Strange bends time, bends the rules and strikes a deal with Dormammu to leave Earth, taking Kaecilius and his followers with him in the bargain. Strange takes over the New York Sanctum and keeps on studying. Mordo, however, strikes out on his own, disillusioned with the knowledge that the Ancient One too drew on the power of Dormammu. Overall, I enjoyed the hell out of this movie and to be honest I'd probably rank it right up there with the first Thor or even the Captain America: Winter Soldier in terms of personal favorites from the MCU. Cumberbatch is pitch perfect casting and ably backed up by Ejiofor, Wong, McAdams and Swinton.